To increase the authenticity of my replica Great War era watch straps for watches with silver cases I decided to make replicas of original period sterling silver buckles. I make these replicas as close as possible to original buckles made during the Great War of 1914 to 1918. They are handmade by me in an old hay loft in Cheshire, England, and hallmarked at the London Assay Office at Goldsmiths' Hall, exactly as the originals were over one hundred years ago. If you have a trench watch from the Great War with a gold or silver case, these buckles are the perfect finishing touch to one of my replica straps. Hallmarking in Britain has its origins in an Act of King Edward in the year 1300. Gold and silver wares have been assayed and hallmarked at Goldsmiths' Hall since 1478, when workers were first required to bring their items to the hall to be marked. This where the term "hallmark" originates. I keep a stock of Type A and Type B designs with sterling silver buckles and 12mm standard length straps that you can order from the Stock and Order List. I also keep in stock sterling silver buckles in other sizes, and usually some 9 carat gold buckles in 12mm ready to be made into straps. If you want something that is not listed as a stock item please please refer to the section below about Special orders. 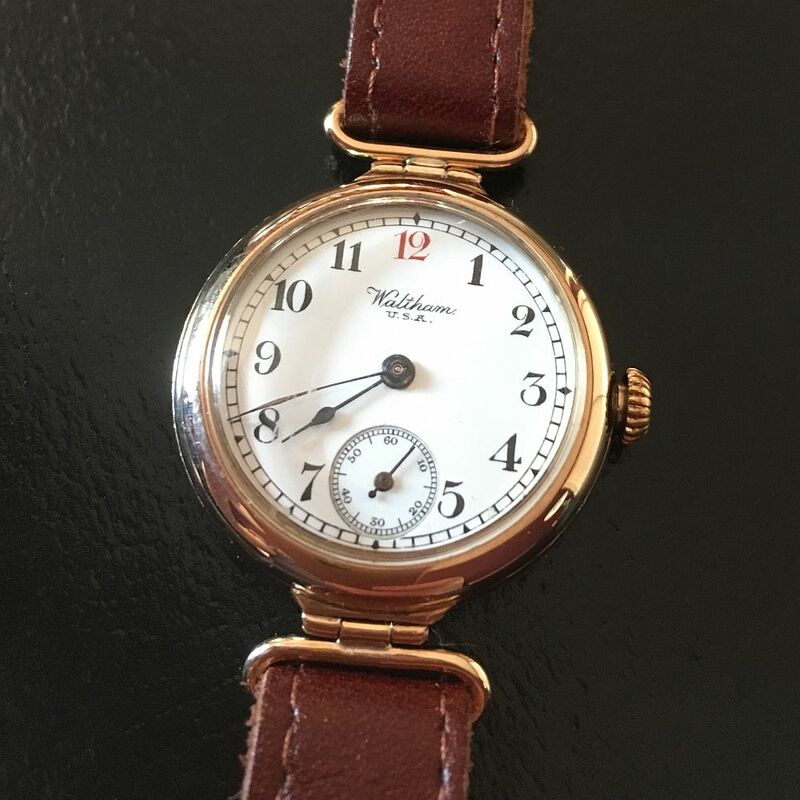 A watch collector bought one of my Type A straps with a sterling silver buckle, and then a few days after receiving it he ordered a second strap; explaining his second purchase he wrote I love the strap so much I ordered a Type B version! 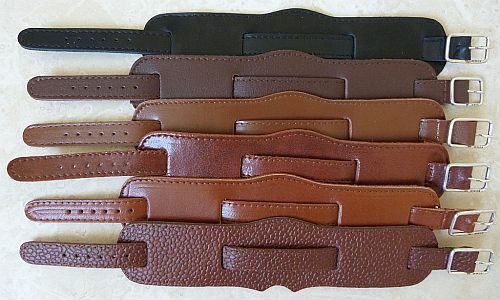 If you want to place an order but are not familiar with my designs, please read the page about My Designs of Vintage Watch Straps. That page includes information about my designs, strap thickness, widths and lengths, leathers, and much more. The stock designs listed on this page have standard length straps and 12mm sterling silver buckles, other widths are available to order. The straps are a length which fit most men's wrists between about 165mm/6½" and 195mm/7½" around. If you don't want to be on the last hole, or need a longer, shorter or wider strap, please refer to the section below about Special orders. My first attempt at copying an original sterling silver hallmarked 1918 buckle was done by entirely by hand and eye using just jewellers pliers. I immediately realised that it was not easy to make bends in the right places like this, and it was impossible to make nice bends. After some head scratching I designed and made a small machine to make the bends neatly and in the right places. The production versions are better than my first attempt, although that eventually turned out well enough that I had it hallmarked and wear it on one of my own watches. The buckles look authentically hand made and "artisan", just like the originals. Just in case you can't tell, in the pictures my replica buckle is the one in the foreground. I make hand made sterling silver buckles in 925 ilver, they are then hallmarked by the London Assay Office with a full set of traditional struck English hallmarks - just like their predecessors were around a hundred years ago. They are assayed and hallmarked in the over 700 year old tradition of British hallmarking by the London Assay Office at Goldsmiths' Hall, where British hallmarking began. Silver has been prized for thousands of years as a precious metal because of its intrinsic beauty and corrosion resistance. When polished it has a bright white appearance unlike any other metal; it makes any steel, including stainless steel and even chrome plate, look dull and grey. If you have a watch with a silver case, a strap with a standard metal buckle doesn't do it full justice, but one of my straps with one of these sterling silver buckles makes the perfect accompaniment to your Great War era trench watch, I am absolutely certain you won't regret it. I usually have a stock of Type A and Type B designs made up with sterling silver buckles and 12mm straps. Other designs and strap sizes are available, these are made up to order, see Special Orders. I have made replicas of two original period sterling silver buckles, one from 1918, the other from 1907. My replica buckles are made in exactly the same way, and assayed and hallmarked by the London Assay Office at Goldsmiths' Hall, so that they are as close to original period buckles as is possible. 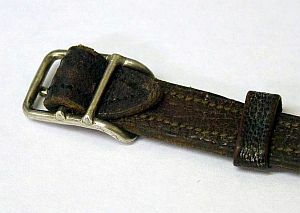 The type of buckle shown here, a "centre bar pin buckle" is the most common design found on early wristwatches. It is "self keepered", i.e. it doesn't need a separate keeper for the strap end to be tucked into. I have a number of these, including the one on my Rotherhams English wristwatch, which has London Assay Office hallmarks for 1908 to 1909. The original buckle that I used as a model for my sterling silver buckles is shown in the background of the picture here. It is hallmarked with London Assay Office hallmarks for 1918/1919. It is a style of buckle that was used throughout the Great War (WW1) and I call it my Great War model, or Type GW buckle for short. I keep in stock straps with Type GW sterling silver buckles ready to purchase in Type A or Type B designs with 12mm straps. I usually keep in stock Type GW hallmarked sterling silver buckles in several sizes, and nine carat gold in 12mm. These are ready to be made into straps to your specifications, e.g. Type B with double slots, Type C, or with straps in different widths than 12mm, or different leather colours. Leathers are available in colours other than the ones that I keep made up as stock items, so you can have yellow or blue or green etc. if you choose. For details of all the available leather colours go to Leather Types and Colours. If you want to place an order for a strap to be made up, please see Special Orders. The second buckle is a slightly more unusual design that fits onto a strap without being stitched into it. This design was associated with British and Swiss registered designs Modèle Déposé No. 9846 which are discussed on my page about trench watches. The Modèle Déposé No. 9846 strap design has a circular section the same size as the watch case in the centre, and there would be only two ways such a strap could be fitted to a watch with fixed wire lugs, either the buckle would have to stitched to the strap after it had been fitted to the watch, or the buckle would have to be designed to fit to the strap without stitching - which is exactly what the Type RD design does. The photograph here shows how it fits to the strap. When I got hold of an original strap with one of these buckles, I saw that the buckle itself had a Registered Design number RD 499803 and I was able to get some details of this from UK Board of Trade records, an extract from which is shown here. 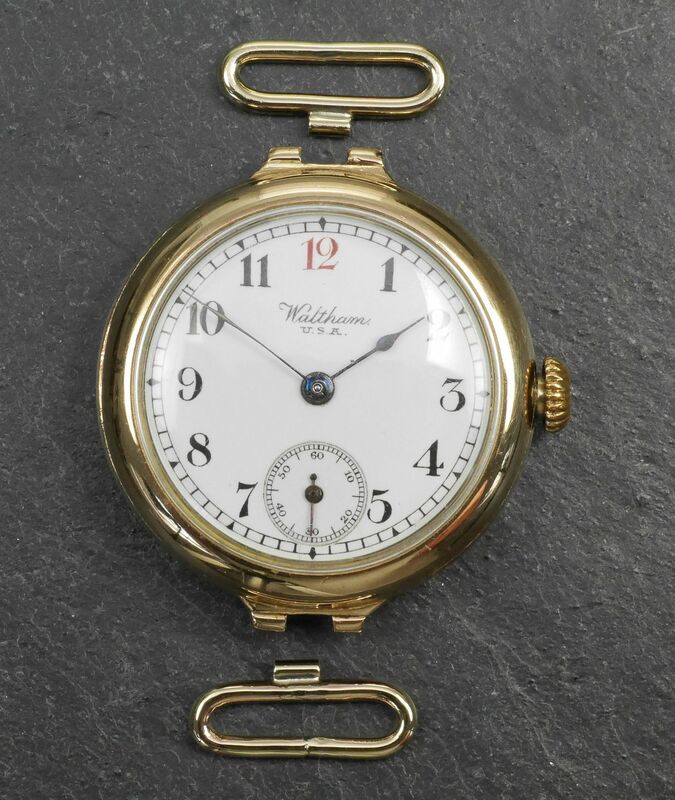 The records showed that the design had been first registered in April 1907, which is quite early in the history of the wristwatch, and shows how people were still experimenting with designs of wrist strap. I call my replica of this buckle my Type RD design. I have made a small batch of these in 12mm. A cutter has been made for the strap ends, so I am now ready to take orders, please inquire if you are interested. NB: Type RD buckles are currently out of stock. Straps with the Type RD buckle are made to order only. They are exactly the same as my standard straps, just with the Type RD buckle instead of a type GW buckle. I do not plan to offer exact replicas of the Modèle Déposé No. 9846 strap with its widened centre part. Because the Type RD design requires a special additional cutter to shape the strap ends where they pass through the buckle this adds an extra complication and I am unlikely to offer this design in anything other than 12mm. If you need other sizes, the Type GW model buckle is available in 10mm, 12mm and larger sizes. NB: I currently have no Type RD buckles in stock and no plans at the moment to make any more. I supply buckles in nine carat gold, hallmarked at the London Assay Office as were the originals over a century ago with a full set of traditional hallmarks for nine carat gold, which includes the sign of a crown for gold instead of the walking lion passant of sterling silver. NB: Straps with gold buckles are not stock items, they are only made up to Special Order. Original gold buckles that I have seen are small in both overall size and wire diameter compared to my Type GW design. This was probably done to keep the cost down, but they look wimpy on a man's strap. I prefer my gold buckles to be made in 2.0mm diameter wire as shown here, which increases the cost of the gold. But they look ‘right’ and I always think that if you are going to do something, you might as well do it right. One of my designs of strap with one of my hand made, London hallmarked, 12mm Type GW nine carat gold buckles in standard leather is £135 or Italian leather £137, plus p&p. Because of the high cost of gold bullion compared to silver (about 25 times as much) I do not keep made up straps with gold buckles in stock, but I usually have some 12mm nine carat gold buckles ready to be made into whatever strap design and leather colour you choose. Other sizes than 12mm can be made to order, which might involve some one-off costs such as extra postage and hallmarking charges. If the buckle cannot be marked as part of a batch, which might require a delay of several months, one-off hallmarking would add £50. The extra cost of gold adds £10 for each extra 2mm of width. The first three nine carat gold buckles that I made were in response to a request from a Danish collector. They are shown in the photograph here on straps made up in dark brown Montana grain leather. I received the watch straps with the 9 carat buckles Friday afternoon. The buckles look really great, excellent craftsmanship. I love the way the hallmarks are made on the buckles! And yes, this is really the right size of a buckle on a man's watch strap! I am more than pleased ! The second customer for one of my hand made and London Assay Office hallmarked gold buckles was a collector in the Netherlands. He wanted a strap with a gold buckle to go with his gold Angora Watch Company wristwatch with hermetic case made by the Borgel company of Geneva. Do I think the strap is beautiful? I think it is magnificent!!! If you want to order one of my designs of straps with a gold buckle, please email me with the details and where you live (just the country, for the postage) and (provided that I have a buckle in stock) I will send you a PayPal invoice to place the order. I can now supply my Type GW gold buckles in 9 carat rose or pink gold. The image here shows several of my standard Type GW 9 carat yellow gold buckles and a T-bar fitting for a leather Albert fob in 9 carat yellow gold. The buckle in the left foreground is in 9 carat rose or pink gold - it's just a single colour but seems to be referred to interchangeably as either rose gold or pink gold. Please bear in mind that most computer monitors cannot reproduce colour with 100% fidelity, so the actual yellow or rose / pink colour can be slightly different in reality. At the moment, rose / pink 9 carat gold is not a stock colour. Items in 9 carat rose / pink can be made to order, but hallmarking presents a logistical problem. The items in the image are all hallmarked, they have just returned from the London Assay Office where they were tested for fineness and hallmarked. This involves insured postage in both directions, and the assay office has a fixed minimum charge, so hallmarking just a single item works out expensive. If you are interested in having a strap with a rose / pink gold buckle made, please get in touch to discuss. My sterling silver buckles are assayed and hallmarked in just the same way as the ones I am copying, at Goldsmiths' Hall in London, where silversmiths have been taking their work to be tested and hallmarked since 1478, which is how the term "hallmark" originated. 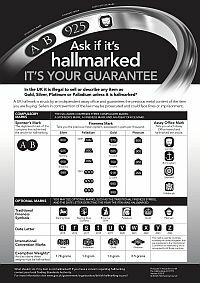 If you want to know more about the over-700 year old tradition and legal requirements of hallmarking, see my page about Assay and Hallmarking or the The Goldsmiths' Company Assay Office web site. My sponsor's mark, my initials "DBB" in a shield with angular ends, first registered with the London Assay Office in 2012. The lion passant, the walking lion that has been the standard mark of sterling silver since 1544 in the reign of King Henry VIII. The 925 mark which indicates the silver purity (sterling = 92.5% silver), required since 1975. The leopard's head, the standard mark used on sterling silver by the London Assay Office since 1300. The assay office date letter, in this case an "o" for 2013. Since 1975 the date letter shows the calendar year. The form of these hallmarks goes back to 1544 in the reign of King Henry VIII; the one with the six wives. If he were alive today, King Henry (who died 28 January 1547) would recognise the validity of these hallmarks and know that this was legal sterling silver. He wouldn't recognise the additional 925 mark, but that is the only change that has been made to these traditional English hallmarks in over 470 years. Silver is a noble metal and doesn't oxidise like base metals. It will however pick up sulphur from the atmosphere and form a black layer of silver sulphide on the surface, this is called tarnish. For cleaning my sterling silver buckles, or anything else made of silver, I find that the polishing cloths made by Town Talk are really good. 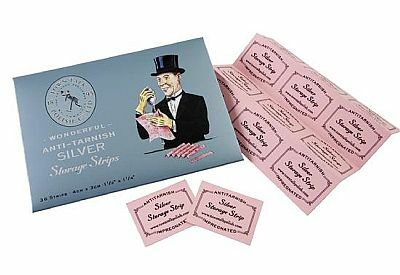 They are ideal for cleaning my sterling silver buckles, and also for silver watch cases, because there is no messy liquid to get onto the leather strap or into the watch case, just a rub with the dry cloth brings up the silver beautifully clean and with a really good shine. 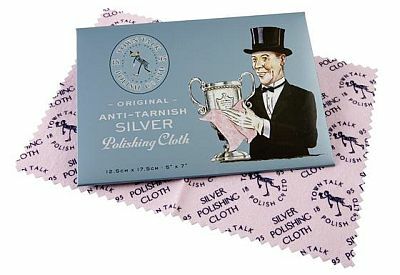 Town Talk have been making polishing cloths since 1895 so they have really got the hang of it now. Their high quality cotton silver polishing cloths are impregnated with silver cleaner and an anti-tarnish agent. They remove tarnish from silver leaving it really sparkling, and the anti-tarnish agent helps to keep it that way for longer. I find the 5 x 7 inch (125 x 175 mm) Town Talk polishing cloths are a good size for watches. You can use the "Add to Cart" button underneath the picture to add one of these to your order for just £2.50. Have you noticed that silver items go dull when they are in storage? Make sure your fine silver items stay shining bright by storing them with a Town Talk Silver Storage Strip. The Strips absorb atmospheric pollutants and help keep your silver shining bright. Store your silver item with a Silver Storage Strips in an enclosed space. The strips need to be replaced from time to time depending on storage conditions. The Silver Storage Strips come in packs of 36. You can use the "Add to Cart" button underneath the picture to add one of these to your order for just £2.50. 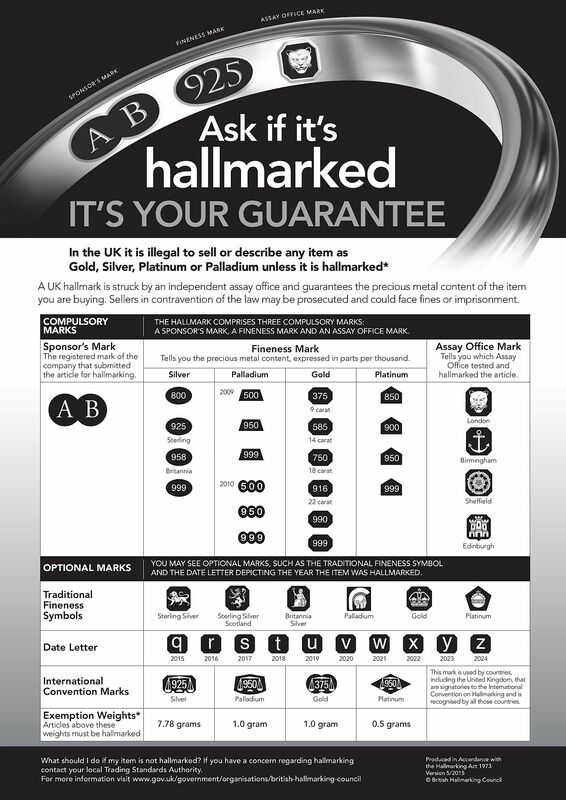 Because I am now officially a "maker and dealer supplying precious metal items" I have to by law display this notice produced by the British Hallmarking Council explaining the approved hallmarks. Click on the thumbnail to get the full size version. If you want a fuller explanation of British hallmarks you will find it on my British hallmarks page, or for British hallmarks applied to imported items on my British import hallmarks page. Silver has been prized for thousands of years because of its intrinsic beauty. When polished it has a bright white appearance unlike any other metal, it makes any steel, including stainless steel, and even chrome plate look dull and grey. This is due to its electron configuration, which results in it reflecting all electromagnetic radiation of wavelengths longer than 3000 angstroms, which is in the ultraviolet range. All visible light, wavelengths between 4000 and 7000 angstroms, is reflected, resulting in the white colour of the pure metal. Silver does not oxidise, but can form a surface layer of silver sulphide which is black - that's when you need one of my polishing cloths. My sterling silver buckles are made from solid silver wire so there is no plating to wear through or flake off. The Great War era buckles that I have replicated (which you can see in the pictures) look as good today as they did when they were made around 100 years ago, you can't say the same about any chrome plated buckle or watch case. I can confidently say, in fact I guarantee Guarantee excludes damage however caused and/or excessive polishing, that my sterling silver buckles will last and look as good in 100 years as when I made them. There are not many things you can say that about. And even if you do manage to wear out the leather strap, you can always send the buckle back to me to be stitched into a new strap. I keep in stock some 12mm hallmarked Great War model sterling silver buckles already made up into straps, ready to order for immediate dispatch, these are available to order using the buttons further down on this page. NB: Although I keep only the basic Type A and Type B designs in stock ready made, if you want a Type B design with double slots or a Type C there is the possibility that I can swap a strap with a sterling buckle onto a ready made one of these. Email me to inquire. Any straps that are out of stock will be available again soon, usually within about a week. Email me if you want to pre-order one for immediate dispatch as soon as available. If you are not familiar with the PayPal shopping cart, please read the "Instructions for Ordering". If you have any problems, don't hesitate to email. The pictures show some of my Great War sterling silver buckles made up into straps, and some of the available leather colours. If you click on the pictures you should get an enlarged image. 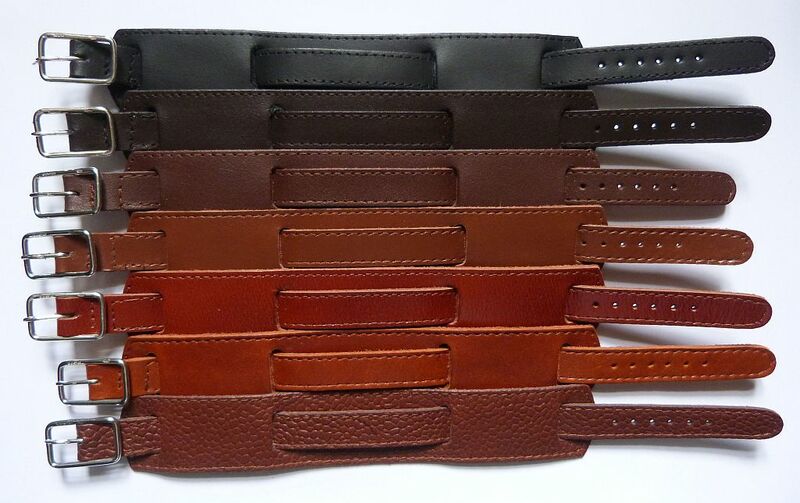 The first picture shows Type A straps in, from the top, black, sepia, military tan, brandy and tan morocco. 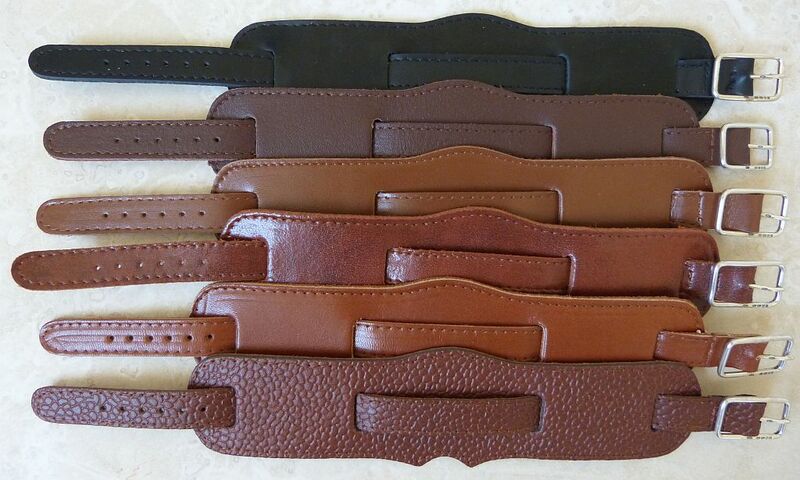 The second picture shows Type B straps in, from the top, black, sepia, military tan, chestnut, brandy and tan morocco. I also have high quality Italian leathers in beautiful rich dark chestnut colour and lighter brandy colours. These are also stock colours. 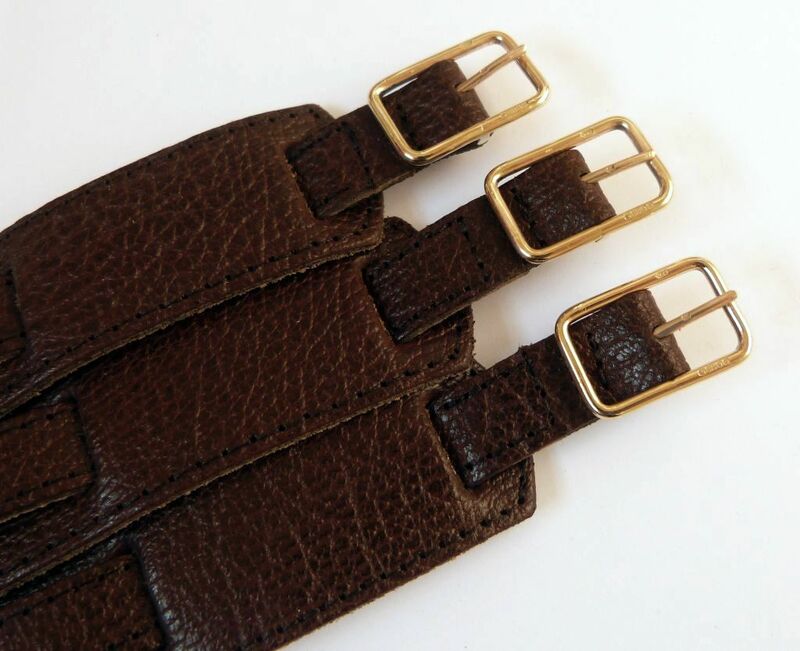 Please see strapdetails — leather and the pictures page for pictures of the chestnut, dark chestnut and brandy, for pictures of all the available leather colours. 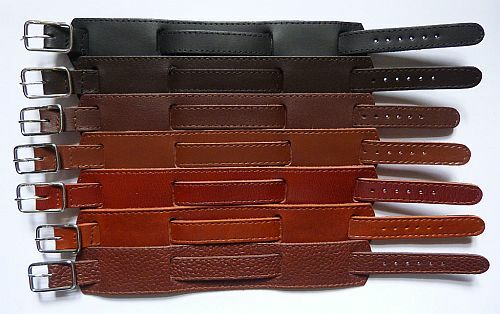 If you want a size or design of strap that I don't keep in stock, such as a Type C or a two piece strap without back pad, a non-standard length, or a colour that is not kept in stock, that's not a problem because I keep some buckles on hand ready to be made up into straps. There is no extra charge for different sized sterling silver buckles. 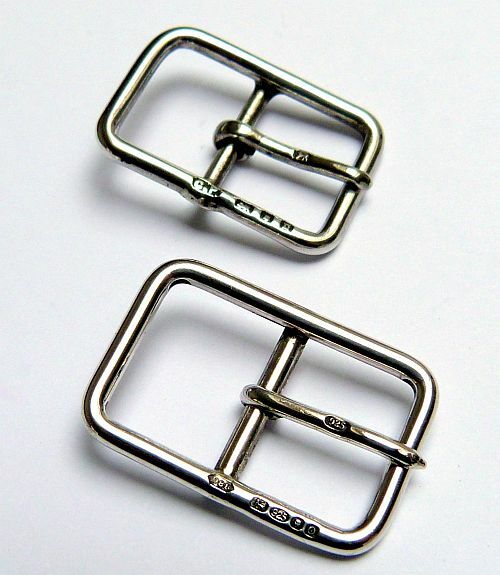 I usually keep in stock Type GW hallmarked sterling silver buckles in 10mm, 12mm, 14mm, 16mm and sometimes 18mm. 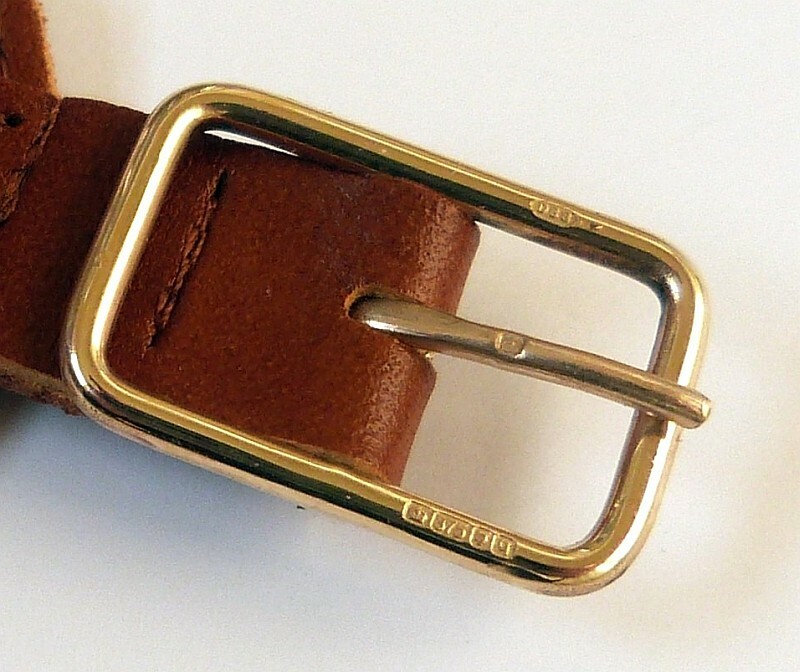 I usually keep Type GW 9 carat gold buckles in 12mm. 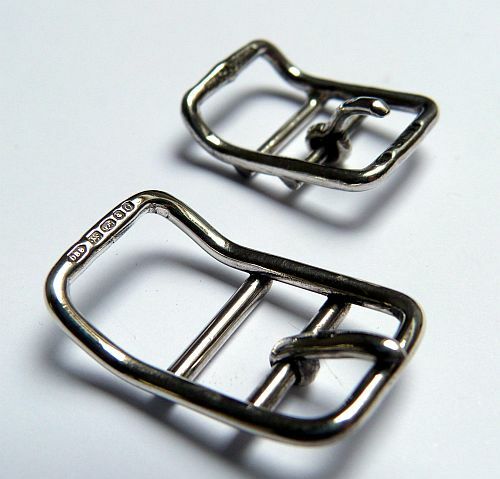 Stock buckles can be made up into straps to special order in whatever design (Type A, Type B or Type C, etc.) and leather colour you choose. Remember that leathers are also available in colours other than the ones that I keep made up as stock items, so you can have yellow or blue or green etc. if you choose. If you want to place an order for a strap to be specially made, please refer to the section about Special Orders. Loop Ends. Click image to enlarge. Britannic Bracelet. Thanks to www.historyworld.co.uk. Click image to enlarge. Watches sometimes have case lugs that cannot take a leather strap. 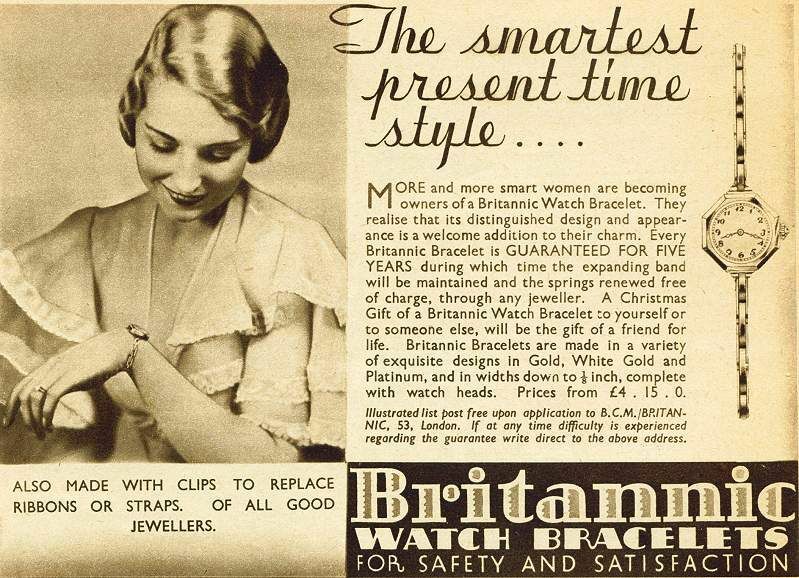 These are usually ladies watches that were originally fitted with expanding metal bracelets, most likely a Harrop "Britannic" as shown in the advertisement reproduced here. 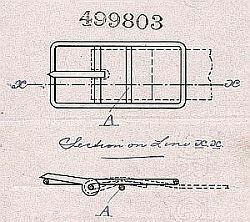 Edwin Harrop was granted a patent No. 24396/06 in 1907 for this design, which became extremely popular. In the Rolex Vade Mecum, Hans Wilsdorf says ‘Next came the idea of expanding bracelets, which an important jewellery firm invented and launched in about 1906. This too won the approval of our British clientele ... [and] became increasingly popular throughout the Empire.’ So the early success of Rolex was, in part at least, due to Harrop's Britannic bracelet. The Britannic bracelet was guaranteed for five years, and tested in public demonstrations over 110,000 cycles. But they don't last forever, especially in everyday use, and many watches from the pre-war period have had their Britannic bracelets replaced. The watch shown in the image was originally fitted with an expanding metal bracelet. 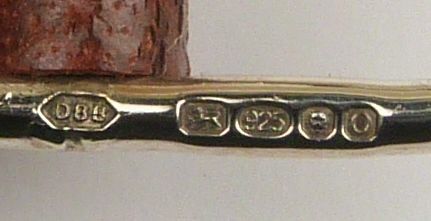 The attachment to the case of the bracelet takes the form of lugs soldered to the case, with a pin or bar spanning the small gap between them. The pins passed through the ends of the metal bracelet, securing it to the case. The very small gap between the lugs becomes a problem when the bracelet wears out. Many of the watches that I see like this have been fitted with expanding bracelets like the one in the image below. It is impossible to fit a leather strap directly to the small pins between the lugs. 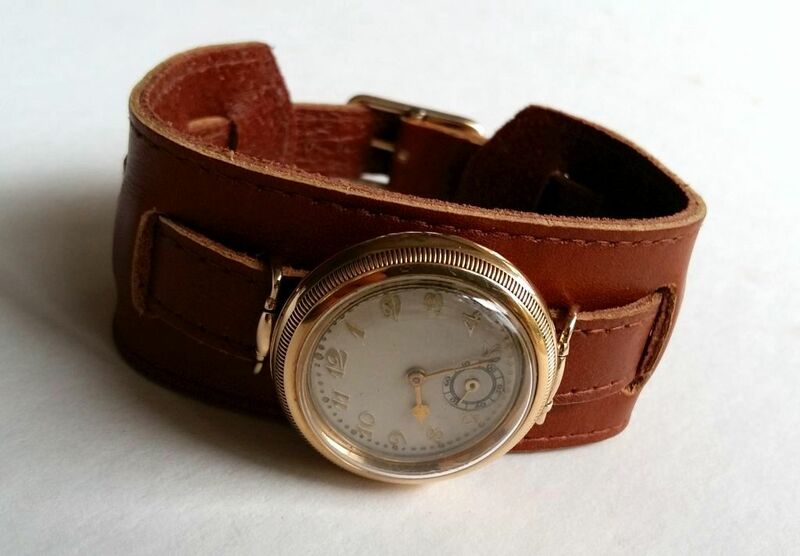 To attach a leather strap to a watch like this, a "loop end" or "jointed loop" is first attached to the case. The loop end can swing around the pin; in watchcase making terms, a joint is type of hinge like this hence the name jointed loop. 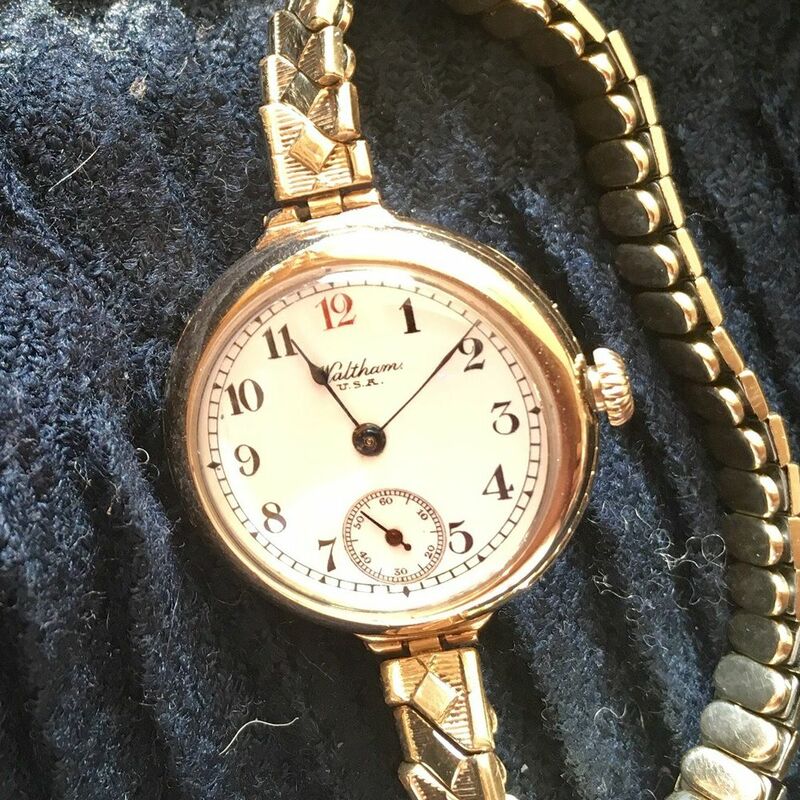 I originally thought that the loop ends fitted to my grandmother's watch were original to the case, but I now realise that it is one of the watches that Wilsdorf talks about, originally fitted with a HarropBritannic bracelet. If you want to attach a leather strap to a watch like this, I can manufacture loop ends as shown in the picture. The loop ends in the picture are 9 carat gold to match the gold watch case. I can make loop ends gold or sterling silver. The loop ends can be made to take any width of strap you prefer, from 8mm upwards in 2mm increments. The cost depends a little on the width, but as a guide two loop ends in 9 carat gold to take a 12mm strap cost £60 plus p&p, in sterling silver they would be £35 plus p&p. I need to have the watch to make and fit the loop ends so factor in postage and packing, which is best done by Royal Mail Special Delivery at about £10 each way. If you want to order a pair of loop ends, please contact me via my Contact Me page. The images below are before and after shots of the watch in the image above. The leather strap is a ladies two piece 12mm open ended in dark chestnut Italian leather. I can supply straps like this at a cost of around £20. My hand made buckles are accurate replicas of period buckles that were fitted to officer's wristwatches and to trench watches during the Great War 100 years ago. They look hand made because that is how the originals were made, right at the start of the wristwatch, and they suit period watches perfectly. There are two reasons why my hand made sterling silver or gold buckles are not suitable for later watches. Appearance: Because of their period design and hand made appearance, my hand made buckles are not suitable for "modern" watches. By the 1930s watch cases were looking more "machine made" and the correct look for their buckles needs to match this. The style of the buckle needs to match that of the watch. Material: The material needs to match the watch case, silver with silver, gold with gold. Sterling silver will not match a steel watch case because silver is much whiter in appearance than any steel and makes it look dull in comparison. Mostly I supply my sterling silver buckles on 12mm straps, because that is what Great War era trench watches usually take. I do keep a few wider buckles in stock up to 18mm for old style watches that need a wider strap, such as watches with cushion cases, or wire lug watches that have had their lugs altered. The Type GW style of buckle does not look right to me in sizes bigger than this. I could make a bigger buckle if you really want me to, but I couldn't get just one buckle hallmarked so it would either have to be without hallmarks, or wait until I send in a batch to be marked. My Type GW and Type RD buckles are replicas of buckles that were made for wristwatches with silver cases and wire lugs. The cases of these wristwatches were made in the traditional way and are rounded, without flats or sharp edges. They were made at the beginning of the twentieth century around the time of the Great War, from the early 1900s into the 1920s. Because of their design the Type GW buckles do not look right with "modern" watches with horns and bars for the strap rather than wire lugs. Modern watch cases made by machine have flat surfaces and sharp edges. A hand made replica of a 100 year old buckle would not look right with a modern looking watch case like this. Additionally, most modern watches have steel cases. Silver has been prized for thousands of years as a precious metal because of its intrinsic beauty and corrosion resistance. When polished it has a bright white appearance unlike any other metal; it makes any steel, including stainless steel and even chrome plate, look dull and grey. Because of this I wouldn't recommend a sterling silver buckle, even a modern machine made one, be used with a steel watch. If you are not familiar with my designs of replica straps for vintage wristwatches, please read the page about my designs of period replica watch straps for vintage wristwatches before you try to make an order. That page includes guidance on strap lengths as well as other details; it's a bit long winded because I have tried to answer as many questions as possible. I keep in stock some of my sterling silver buckles in 12mm size made up into straps, these are available to order using the buttons below. If you are not familiar with the PayPal shopping cart, please read the "Instructions for Ordering". If you have any problems, don't hesitate to email. Type B in tan morocco with double slots and Great War sterling silver buckle. Click image to enlarge. If you want something other than the stock straps I have listed below, e.g. double slots, this can be specially made for you. The picture here shows a Type B with 10mm strap in tan morocco with double slots and a Great War sterling silver buckle specially made for a customer. If you want a special order like this, please refer to the section below about Special orders. If you are not familiar with my designs of replica straps for vintage wristwatches, please read the page about my designs before you try to make an order. For general terms and conditions, please refer to the ordering standard straps page. To order a strap from the list below, click on a button to add a strap to the PayPal "Shopping Cart". This will take you to a PayPal screen. You must then click on the grey "Continue Shopping" button to come back to this page to add postage and packing / packaging and shipping (p&p), or more straps. I keep a stock of Type A and Type B with standard length 12mm straps and GW sterling silver buckles which you can purchase using the PayPal buttons listed below. 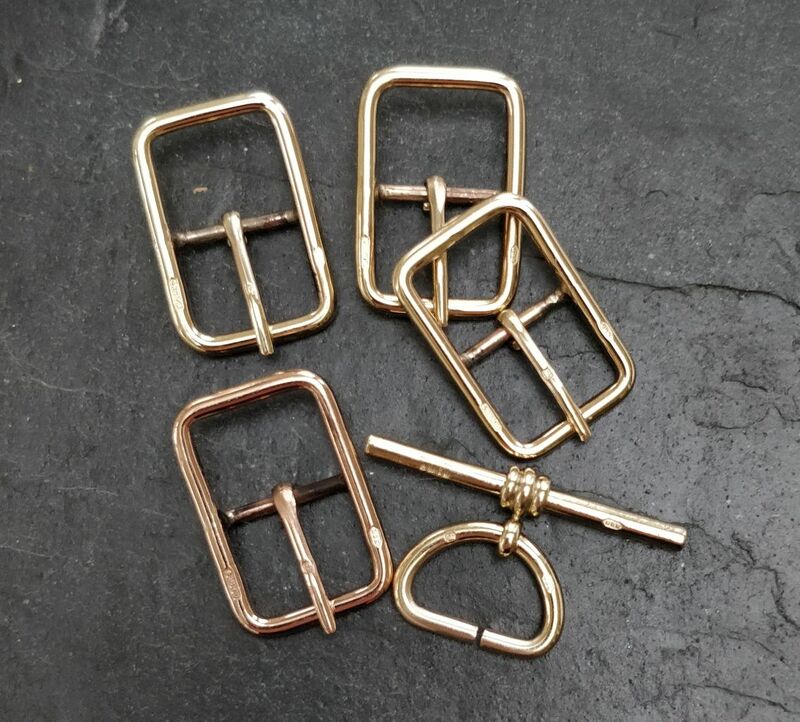 Type GW buckles are also usually in stock in 10, 14, 16 and 18mm in sterling silver, and 12mm nine carat gold; these can be made into straps to order. For current leather colours see Pictures. To order a non-stock item or width, see Special Orders.